bunnie has graduated from MIT. Please update your bookmarks to http://www.bunniestudios.com/blog/. You should be automatically forwarded in a couple of seconds. Once space is conquered, all that will be left is here. once time is conquered, all that will be left is now. should we not meet again? Irassyaimase! I, like other Web users, am working to fulfill the old man's prophecy by providing this home page. The Internet conquers space; it folds and flattens our four dimensional world of three spacial and one temporal coordinate into a two dimensional world of but one node and one temporal coordinate. And who sez that computers are impersonal? Individuals identify themselves with their home page; every home page is colored by the author. The internet is filled with the synergy of human intellect; it is almost a conscious entity in its own right. Its two-dimensional body is intangible to us, but the internet is our evolutionary successor. I hope to influence this child, if ever so minutely, by configuring these bits into something which will communicate a likeness of myself. My name is Andrew Shane Huang; my Chinese name is Huang(2) Xin(1) Guo(2) (and if you mix my name and my father's, it's a prophecy). I am 183 cm (6 ft) tall, 83.9 kg (185 lb). I'm Asian, but that's a bit general (after all, over 20% of the world is Asian). I was born in 1975 (year of the rabbit), and I call Kalamazoo, MI my home. I just finished my PhD dissertation at the Massachusetts Institute of Technology. I am working in Tom Knight's Project Aries research group. My interests include all aspects of moving information between processors--physics of communication, high speed signalling, reliability, fault tolerance, protocols, data placement, coherence (or lack thereof), and APIs. The project has been undergoing a lot of change lately, so the web page is somewhat out of date, but that's a natural consequence of how fast technology moves these days. Here is a presentation on my work-in-progress (postscript only, try ghostscript to view) with respect to abstract machines and streams, and a short white-paper about some of my ideas on spatially aware decentralized computing. My finished thesis can also be found here. I also did my undergraduate studies at MIT as well. As an undergraduate, I lived at Zeta Beta Tau fraternity. I was Vice President of the fraternity, and I look forward to being an active alumnus. In between and all through my undergraduate and graduate studies, I've tried to keep in touch with industry through various internships and employment opportunities. I have worked for some companies you've heard of (Intel, Qualcomm, SGI) and many you haven't (E-Ink, Microdisplay, Mobilian, Solana Technology Development (now Verance)). Video game console hacking...it's sort of a hobby to open these things up and learn from their innards. SH-1 Workhorse flexible embedded controller board. Credit-card sized board for embedded applications that need a big punch in a small package. 12 MHz SH-1 32-bit RISC with 8 MB DRAM, 1 MB FLASH, and many other features in just 2" x 3"! I built this board for a seminar on embedded controllers that I taught over IAP 1999 at MIT. This board will be used in the MIT AUV team's ORCA-2 submarine, as well as in my car. StrongARM embedded systems. I've spun some boards with Intel StrongARM processors that run linux in my "spare time". I am progressively shrinking the board, and I hope to eventually someday build a robust, wireless-networked linux computer that fits in the footprint of a Motorola Star-Tac cell phone. Some Sega Dreamcast hacking. I recently built a little board that lets me read out the ROM contents of my dreamcast and plug a standard FLASH device in its place. I really need to get a digital camera so I can take a picture of it. Digital tachometer for my Toyota Corolla. I recently added a 128x64 graphic vacuum flourecent display to the dashboard of my car, where I get a tach reading. I added it because my car is a manual and for some silly reason it didn't come with a tachometer. The tachometer uses the Hitachi SH-1 to measure the time between ignition pulses and to control the VFD. The relevant source code is available; these files are meant to be integrated into Hitachi's CMON monitor provided with their evaluation board. My Master's thesis research...The thesis is done, but the topic is quite open ended. My thesis focuses on architectures which use reconfigurable hardware as computational elements. More on it down below. Hardware DES cracker. I've got 56-bit DES cracking in an FPGA now clocking in at over 500,000 keys/sec/node and I am "seasoning" it to work with unix crypt(3) passwords. I'm massaging the design so I can hit 2,000,000 keys/sec/node in a scalable network of up to 256 nodes at a low cost per node. Full specs and docs will be posted when I'm done! Keyboard code converter. This little hack plugs in between any AT-compatible keyboard and a host machine. I use it to translate my keyboard layout from QWERTY to dvorak...software remapping is nice, but sometimes it doesn't always work and it's a pain when two people who don't use the same mapping have to type on the same console! My box has a little switch which lets me flip between QWERTY and dvorak. It's about the size of a pack of matches. I have provided the code for the PIC16C84 which is the heart of the box; the PIC drives a pair of PS/2 style serial ports using four transistors that talk to the keyboard and host computer. One of these days I'll make up some schematics and put them here too. Keyboard pedals! In addition to learning dvorak, I have crafted footpedals for my keyboard for the control and shift keys. This helps relieve the strain on my left hand, especially when I am using emacs. The pedals work great, and my RSI is getting better, or at least not progressing as quickly. I will probably be the first person with a case of RSI in his feet though. :-P I installed the keyboard pedals by opening my keyboard and wiring across the control and shift keys to a pair of RCA jacks which I installed on the lower left corner of my keyboard. The pedals I built plug into those jacks. Here are some brief instructions on how to do this for your keyboard; I could put a picture up on the web about it too if you're having a hard time. DRAM FAQ where I try to take on the impossible task of summarizing all the varieties of RAM available on the market today. So far, I've only gotten to FPM, EDO and just started SDRAM! I think they are making new RAM types faster than I can document them...I think I am going to give up on this one. Datfiles for XV hack where I add datfile capabilities to xv-3.10a. Not too exciting, but possibly useful if you're a researcher at MIT. The link is to a gzip'd tar file with the patch code and a README. It's only useful if you know what datfiles are...you can get the xv source tree from ftp.cis.upenn.edu/pub/xv. TSOP package FLASH ROM burner (picture coming soon). I decided to start using these fun parts in my projects lately--they are so small and cheap--but the problem is that buying an appropriate programmer for them often costs upward of $500! So, I built my own burner. Its incredibly easy to do, and it costs around $200 (of which $140 went to the TSOP to DIP adapter that I got through Emulation Technologies). It plugs into your PC parallel port. Visit the design documentation page for more info. Pictures of some projects I've done in the past...these are mostly stuff I did in high school and junior high so I'll be putting their details on-line last. Back then, I only had a drafting table, paper, and pencil so my doc's aren't in a nice and easy to deal with electronic form. More to come! I've got a long list of projects, and each takes a few hours to properly HTML-ize. Another big project which I have done is my master's thesis. It was a joint QUALCOMM Incorporated-MIT effort building a reconfigurable hardware processor which I named Tao. QUALCOMM is in San Diego. They hold the patent for CDMA and other spread spectrum communications stuph. They also sell Eudora, and their stock does well. I used to be a recitation instructor for MIT's 6.004 class. I had the privelege of creating a new generation of lab kits for the class. The new lab kits are complete. Students now get a set of computational blocks (CBs) which have their function set by software (ie, gates, adders, registers, muxes...you name it). They wire the blocks together using single wires that carry multiple bits (up to 32 at a time) of information to ultimately create a full 32-bit RISC microprocessor. The kit also features boundary-scan capabilities so students can verify their wiring, an on-board embedded controller to aid debugging, buttons with programmable behavior, and an LCD screen. I won't bore you with my academic pursuits, but I will bore you with some of the activities I enjoy. A few things which light up my life include great parents, great friends, playing the violin (I've been bowing 'em strings for over fourteen years now), playing the guitar, spinning electronica, and playing with electronic stuff...I like to hack around. Check out the ZBT picturebook; lots of photos of life in my fraternity! Also, check out my scrapbook. The graphics collection is mostly some pictures I thought were cool over the years so I scanned them in. The scrapbook has a lot of photos of my good friends or places I've been. I also have pictures from my graduation in '96 when I got my SB and MEng degrees. I've finally been on the web long enough (it's been a few years now) so I finally have a few bookmarks of kewl stuff I've found or frequently visisted sites, mostly of interest to EE types. If you would like a resume, please send me email (bunnie@nospam.mit.edu (delete the nospam. to make the address work)) and I will send you a link to a copy in Adobe PDF. Open your eyes, see all the love in me; I got enough forever. Don't be afraid, take all you need from me, and we'll be strong together. -- Brisk and Trixxy, "Eye Opener"
My wonderful girlfriend Nikki and me at the Lost River in New Hampshire! 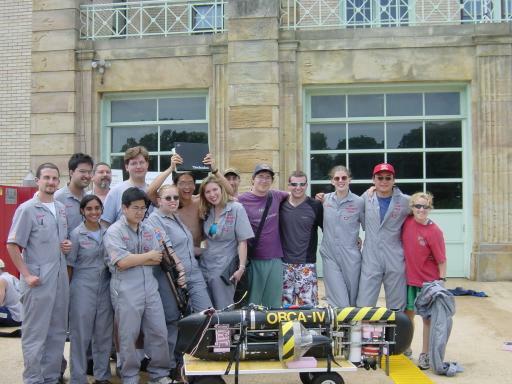 I went to Annapolis, MD, in July with a team from MIT to compete in the 1st Interational Autonomous Underwater Vehicle competition. Our entry was ORCA, a fully autonomous submarine sporting a pentium-class on-board computer running linux, a homebrew INS, downward and forward looking sonar, a doppler velocity log, and a 3-axis magnetometer, among other fun stuff. I helped design the sensors, write low-level driver code, and assisted mission planning, among other miscellaneous tasks. This page has been accessed at least times since the counter was last reset, or February 14, 1997, whichever is more recent.